The track plan should be abstract, clear and functional in accordance with the "Golden Rules". The tracks should be positioned around the turntable in such a matter that the order and position of the layout are shown. Position all blocks with the minus side facing the turntable. Select the turntable symbol as large as necessary, but as small as possible. The symbol can be scaled in the grid in a size of 2x2 to 13x13. (Dialog Turntable: General). The number of track exits displayed around the turntable varies accordingly. With sizes 4 and 5 used on this page, up to 16 or 20 track exits can be displayed. With the turntable max. possible 48 track exits require size 11 or 12. The turntable symbol has 48 possible track exits. Starting with track number 0 in the east, 12 in the north, 24 in the west and 36 in the south. The track number only determines the direction in which the track exits are displayed on the symbol. Tip: Just try changing the track number until the right direction to the outgoing track is found. In the table Turntable: Tracks enter the corresponding track blocks. In the dialog Turntable: General activate the option "Manage track blocks". Rocrail then creates all relevant routes independently and temporarily at each restart. If individual settings in the routes are desired, it is advisable to engage in dialog Routes: General remove the option "automatically generated". Thus the routes are generated and statically stored in the plan. Routes can of course also be created manually. After generating these routes assign the sensors -as usual- in this dialog Block: Routes. 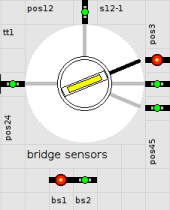 For the integrated bridge block, the sensors are in dialog Turntable: Interface incorporated as sensor 1 - 4. These sensors must also be created in the Table→Sensors. If desired, the integrated bridge block can also be displayed as an external block. It is an isolated block (without tracks) to be positioned in the plan, it must receive the same identifier as the turntable. In the dialog Block: General should the Turntable identifier be selected, so that Rocrail knows that it is a bridge block. After the aforementioned steps in the dialog Turntable: General deactivate the option "Manage track blocks" (The routes were already saved) and - if still marked - also remove the option "integrated block". In this example, the bridge position sensors are left visible for clarity. In the track plan of layouts you can with the option 'Show' set the sensor to invisible. For best results for positioning the locomotive, it is advisable to interrupt a bridge track and set up two sensors, as shown on the page Turntable. 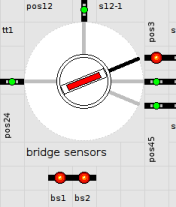 If mechanical changes to the bridge are to be avoided, the enter2in sensor can be used instead with only one feedback. It should be noted, that with the individual characteristics of each locomotive, accurate positioning on the bridge is more difficult.